Human NK cells can be subdivided into various subsets based on the relative expression of CD16 and CD56. In particular, CD56brightCD16−/dim NK cells are the focus of interest. They are considered efficient cytokine producers endowed with immunoregulatory properties, but they can also become cytotoxic upon appropriate activation. These cells were shown to play a role in different disease states, such as cancer, autoimmunity, neuroinflammation, and infection. Although their phenotype and functional properties are well known and have been extensively studied, their lineage relationship with other NK cell subsets is not fully defined, nor is their precise hematopoietic origin. In this article, we summarize recent studies about CD56bright NK cells in health and disease and briefly discuss the current controversies surrounding them. Natural killer cells are cytotoxic type 1 innate lymphoid cells that are important in anti-infectious and anticancer defense. In humans, they are subdivided in various subsets based on the relative expression of the adhesion molecule CD56 and the low-affinity FcγR CD16 (Fig. 1). The CD56dimCD16bright population is predominant in peripheral blood, whereas NK cells from secondary lymphoid tissue and from other tissues are primarily CD56bright (1, 2). In this review, we focus almost exclusively on CD56bright cells and discuss their relationship with other subsets, their development, and their roles in homeostasis and disease in an effort to update our knowledge about this topic. Heterogeneity of human circulating NK cell subsets. (A) SPADE tree was generated from 18-colors fluorescence flow cytometry staining (live/dead marker, CD14, CD19, CD3, CD16, CD56, CD8, CD27, CD45RA, CD57, CD62L, CD69, CD158a,h, CD158b1,b2,j, CD279, NKG2A, NKG2C, NKp30) on human PBMCs. Gating strategy included live, single, CD3−CD14−CD19− cells and clustered on CD56 and CD16. Node color represents the median fluorescence intensity of CD56, and node size depicts frequency as represented in the scale. (B) Markers used to distinguish the different NK cell subsets. CD69 is not represented. A still unresolved issue is the lineage relationship between CD56bright and CD56dim NK cells: are the former immature precursors of the latter, or are they two separate lineages with different origins and properties? Although a consensus in favor of the first possibility seemed to have been reached, the most recent articles from leaders in the field shed doubt on that conclusion (Fig. 2). The Caligiuri group (3) presented several arguments for considering CD56bright NK cells precursors of CD56dim NK cells in a linear-differentiation model, which was also put forward by Romagnani and colleagues (4). However, the authors (3) recognized that the second hypothesis has not been excluded, because, in particular, activated CD56dimCD16bright cells can upregulate CD56 and lose CD16, so that at least a fraction of them might not be precursors but activated NK cells instead. Fehniger and colleagues (5) also envisage that the two subsets could have different hematopoietic origins. One additional argument in favor of this is the observation that patients with GATA2 mutations have no CD56bright NK cells in the presence of the CD56dim population (6). This selective absence of CD56bright NK cells could suggest the ontogenic independency of the two subsets, although CD56dim cells are reduced in number and functionally impaired and, thus, might still depend, directly or indirectly, on CD56bright NK cells (6). In addition, some of the patients have residual CD56bright NK cells; therefore, they might also be present in other patients but are below the limits of detection. A very recent article by Maciejewski-Duval et al. (7) confirmed the existence of extremely low numbers of CD56bright NK cells in GATA2-deficient individuals. Mace et al. (6) showed that GATA2 is expressed at higher levels in CD56bright NK cells than in CD56dim NK cells, but this does not demonstrate that the expression of CD56 itself depends on this transcription factor. It cannot be excluded that the population corresponding to the CD56bright subset in healthy donors is also present in such patients but lacks CD56 on the cell surface. The ontogeny of CD56+ NK cell subsets: the traditional model with recent alternatives. There seemed to be a consensus that NK cells originate via a linear differentiation model. Hematopoietic stem cells (HSCs) differentiate into CLPs, and then into CD56bright NK cells, and eventually into CD56dim NK cells. The last step probably involves minichromosome maintenance 4 (MCM4). Nevertheless, CD56dim cells are also able to upregulate CD56 after activation, suggesting that a proportion of CD56bright NK cells might not be precursors but activated cells. However, recent research seems to challenge this traditional model. It was proposed that CD56dim NK cells may also derive directly from CLPs and that common myeloid progenitors (CMPs) may also be precursors for CD56bright NK cells. Finally, an additional argument is raised suggesting an ontogenic independency of these two subsets of NK cells, because mutated GATA-2 suppresses the CD56bright, but not the CD56dim, population. The opposite situation is observed in partial minichromosome maintenance 4 deficiency, which is characterized by the selective loss of CD56dim NK cells and an inability of the remaining CD56bright NK cells to proliferate in response to IL-2 or IL-15. This strongly suggests the differentiation of CD56bright NK cells into CD56dim NK cells in vivo (8). The controversy is further fueled by important observations made by the Dunbar group (9) through clonal tracking of hematopoiesis in macaques using the genetic barcoding method. Three irradiated macaques were transplanted with a lentivirally transduced library of individually marked autologous hematopoietic stem cells. Based on the results of this work, the minor blood CD56+CD16− population (equivalent to human CD56brightCD16− NK cells) and the major CD56−CD16+ subset (equivalent to human CD56dimCD16bright NK cells) represent different lineages, and one would not arise from the other. However, although impressive and highly informative, this approach has some limitations (10); further work is required to resolve the question. Furthermore, this article (9) challenges the traditional idea that NK cells are exclusively the progeny of common lymphoid progenitors (CLPs). It was and is still commonly believed that NK cells derive from CLPs, as demonstrated in numerous studies and confirmed by leaders in the field of innate lymphoid cells (11–13). However, recent studies showed that differentiation from the human common myeloid progenitor into mature NK cells is also possible, not only in vitro in the presence of appropriate cytokines and stromal cells (14), but also in a humanized mouse model (15). This adds to the growing insight into a greater plasticity of hematopoiesis than previously thought. Nevertheless, it is very important to confirm that the CD3−CD56+ cells observed are indeed NK cells, because myeloid cells, such as monocyte/dendritic cell–like cells, can also express CD56 but are CD7− and lack classical NK cell–associated markers (16). The topic is even more complex because epigenetic factors also play a role, but this applies more to a diversification of adaptive memory-like CD56dim subsets functionally different from the so-called canonical CD56dim NK cells (17, 18). However, epigenetic modifications might likewise interfere in the cytokine-production process of CD56bright NK cells (19) and perhaps, as well, in their differentiation from the progenitor stage forward. Angelo et al. (20) analyzed a panel of 40 adult healthy donors with respect to NK cell subset distribution with the aim to establish normative ranges. They found that CD56bright NK cells represent 8.56 ± 6.90% (range, 0.63–38.32%) of peripheral blood NK cells, which is in accordance with older literature, but which also means that a percentage >10% (usually considered the upper limit) is observed quite frequently. Moreover, the values varied considerably over time in the three donors tested in this regard. Overall, this study confirmed, as expected, the phenotypic characteristics of CD56bright NK cells (1). It is known that the percentages and absolute numbers of NK cells increase in healthy ageing, but the decrease in the CD56bright subset is interpreted as a lower output of such NK cells from the bone marrow (21). The characterization of the modulation of peripheral blood NK cell subsets in the context of malignant tumors remains puzzling. One of the first studies investigating subpopulations of NK cells was performed using the blood of patients diagnosed with breast cancer (BC) or head and neck cancer. The investigators demonstrated a decrease in the proportion of the CD56bright subset in both malignancies, although the total percentage of peripheral NK cells was similar between patients and healthy donors. However, they reported an increase in cellular apoptosis that was restricted to the circulating CD56dim population (22). The reduced percentage of circulating CD56bright cells was confirmed in head and neck cancer patients by two additional distinct studies (23, 24). In contrast, Mamessier et al. (25) observed that the amount of circulating CD56bright NK cells in BC patients increased in relation to the grade of malignancy. This result was also observed in the blood and bone marrow of pediatric leukemic patients in comparison with age-matched healthy controls (26). A major modulation in the proportion of circulating CD56bright NK cells was described in the blood of melanoma patients compared with healthy donors: they were increased almost 3.6-fold within peripheral NK cells (from 12.2 ± 6.3% to 43.5 ± 17.5%) (27, 28). However, such a modified distribution between CD56dim and CD56bright subsets was not found in the blood of patients with ovarian carcinoma (29–31) or esophageal squamous cell carcinoma (32). Nonetheless, in the latter, the peripheral NK cells exhibited clearly increased CD56 expression, which was associated with a downmodulation of CD16. Interestingly, these phenotypic modifications were restored to normal after curative tumor resection, suggesting that they were promoted by the tumor-bearing state (32). In the case of autoimmune diseases, a representative example is rheumatoid arthritis (RA), a disorder in which the destruction of cartilage and bone results from a chronic inflammatory process (33). NK cells are considered pathogenic elements in the development of the disease (34, 35). The proportions of CD56bright and CD56dim NK cells in the peripheral blood of RA patients are similar to those in healthy subjects (36–39). The same observation was made for type 1 diabetes patients, with no significant difference compared with healthy controls (40, 41). Different results were observed in systemic lupus erythematosus: there was no difference or an increased percentage of blood CD56bright NK cells, regardless of disease activity and treatment (42, 43). In Sjögren’s syndrome, this subset is also increased, regardless of disease activity (44). In contrast, circulating CD56bright NK cells are decreased in juvenile dermatomyositis (45) and in systemic sclerosis (46). In neuroimmunological diseases, such as multiple sclerosis (MS), there are no significant differences in the distribution of CD56bright NK cells in the peripheral blood of patients compared with healthy controls. However, following several MS therapies (e.g., daclizumab and IFN-β), an expansion of regulatory CD56bright NK cells is observed, which is associated with a good response to treatment (47, 48). Therapy with IFN-β induces a decrease in the cytotoxicity and number of CD56dim cells in the periphery, whereas in the case of natalizumab, CD56bright expansion is speculated to have its origin in recruitment from lymphoid organs (3, 49). Fingolimod, a drug that efficiently blocks sphingosine-1-phosphate receptor, induces a reduction in CD56bright NK cells in the blood of patients (50) and reflects a more rapid redistribution of this subset from blood to lymphoid tissue compared with CD56dim NK cells (51). In another context, reduced MS disease activity during pregnancy was observed, which could be linked to the increase in the percentage of CD56bright regulatory NK cells in these patients, assuming a potential capacity of NK cells to control autoimmune inflammation during pregnancy (52). In traumatic brain injury, patients’ peripheral blood CD56bright subset did not fluctuate during the course of intensive care treatment (7 d) (53). In the case of virally infected cells, such as in HIV-infected individuals, progression of the disease is accompanied by a decreased frequency of CD56bright NK cells (54). Although the relatively simple CD56bright/CD56dim dichotomy, with cytokine production and regulatory function for the former and cytotoxic activity for the latter (although they can likewise be considered immunoregulatory as a result of their abundant production of cytokines and chemokines upon stimulation of their activating receptors, such as CD16), was largely predominant in the literature for a long time, more recent articles insist that there is actually a higher degree of heterogeneity among human NK cell populations. This led Cichocki et al. (55) to propose a new classification of four subtypes: CD56brightCD62L+ circulating NK cells, CD56dim canonical NK cells, CD56dim adaptive NK cells, and tissue-resident NK cells. The last are also CD56bright, but in contrast to the conventional CD56brightCD62L+ NK cells, they express low levels of the transcription factor Eomes and are CD62L−, CD49a+, and CD103+. Functionally, the tissue-resident NK cells are more specialized for cytokine production than for cytotoxic activity, although this might differ from tissue to tissue and vary between homeostasis and disease. Tissue-resident human NK cells have been particularly studied in liver and uterus. Remarkably, NK cells can represent up to 50% of total lymphocytes in the liver (56) and are the largely predominant lymphocyte population in the pregnant uterus (57). In the liver, they express tissue-retention markers, such as CD69, CCR5, and CXCR6 (56). In the uterus, they produce a specific cytokine mixture that is necessary for tissue remodeling and the development of new blood vessels (57). NK cell subset modulation in cancer has been investigated in the ascites from several types of tumor. In epithelial ovarian cancer, CD56bright NK cells are enriched in the peritoneal fluid (PF) rather than in peripheral blood (29–31, 58, 59). Interestingly, this also was demonstrated in PF from a patient with gastric cancer (60). One might hypothesize that the accumulation of CD56bright NK cells in the peritoneum is the consequence of obstruction of the peritoneal lymphatic circulation, because this subpopulation is characteristic of secondary lymphoid organs. It is also conceivable that CD56bright NK cells preferentially accumulate in the peritoneum, as observed for tissues and lymph nodes (LNs). However, the lack of information on the composition of NK cell subsets in the peritoneum of healthy donors makes a conclusion difficult. Nevertheless, it should be noted that PF from a patient with pancreatic cancer did not exhibit such an accumulation of CD56bright cells; the CD56dim subset was the major population (60). This discrepancy between cancer types may indicate that tumor-related factors are involved in the modulation of CD56 expression. In contrast, an accumulation of CD56bright NK cells was also observed in the pleural fluid of patients with lung cancer (61), melanoma, or BC (60). In this context, it seems to be specific to the tumor, because noncancerous patients never presented such a high percentage of CD56bright NK cells in comparison with the peripheral NK cell subpopulations (62). In autoimmune diseases like RA, CD56bright NK cells are increased in synovial fluid (SF), where the vast majority of NK cells have a CD56bright phenotype (36–39). In line with this, patients with psoriasis show an increase in CD56bright NK cells in cutaneous lesions (63, 64). Of interest, in pregnant women with type 1 diabetes, circulating CD56+ cells show impaired homing potential into tissues such as uterus, pancreas, and LN (40, 41). Cerebrospinal fluid subsets of NK cells differ from those in the blood. The proportion of CD56dim NK cells is lower in cerebrospinal fluid, whereas CD56bright NK cells are overrepresented and show an activated phenotype because they are able to degranulate more (65). The enhanced presence of regulatory immune cells, such as CD56bright cells, and the reduced recruitment of CD56dim NK cells, limits the potential for immune-mediated destruction of CNS tissues (65). In MS patients, NK cells in the cerebrospinal fluid display the phenotype of a very early stage of maturation, with an increase in the CD56bright/CD56dim ratio compared with controls (66, 67) [defined in accordance with the latest consensus definitions (68)]. Daclizumab treatment leads to a significant expansion of CD56bright NK cells in the cerebrospinal fluid of treated patients, suggesting a direct suppression of the immune responses in the CNS (47, 69). Thus, in a human–mouse chimera model, the adoptive transfer of CD56bright NK cells pretreated with IL-2 complexes ameliorates the severity of experimental autoimmune encephalomyelitis (EAE), and this is also the case after transfer of CD56dim NK cells, leading to a reduction in the capacity of microglia to transactivate the Th17 transcription factor, Rorc (70). The consequences are a decrease in Th17 responses and attenuated EAE. NK cells are also able to reduce IL-17 production by CD4+ T cells in the CNS, underscoring the model that interactions among NK cells, microglia, and Th17 cells determine the magnitude of CNS inflammation in EAE (70, 71). The phenotypic characteristics of CD56bright NK cells in healthy conditions are not discussed in detail in this article because they were redescribed recently (20, 72); nevertheless, they are shown in comparison with CD56dim cells in Fig. 1 and Table I. In cancer, despite the fact that CD56bright NK cells characterized in PF of patients with ovarian cancer phenotypically resembled their classical counterpart in the periphery, with NKG2A+KIR−CD16low expression, they exhibited a reduction in their expression of DNAM-1 and 2B4 (30, 31), as well as an increased expression of NKp46 and NKG2D (30). In contrast, >50% of patients exhibited a reduction in NKp30 expression in PF compared with autologous peripheral NK cells. This decrease was inversely correlated with the detection of one of the cellular ligands of NKp30 (i.e., B7-H6) and was associated with hyporesponsive NK cells (31). The downmodulation of NKp30 was also observed in CD56bright tumor-infiltrating NK cells from gastrointestinal stromal tumor biopsies. However, in this malignancy, modification of the surface expression of NKp46 and NKG2D was not observed (73). CD56bright tumor-infiltrating NK cells highly express markers of cellular activation, such as NKp44 and CD69, as well as the activating receptor, NKG2D. Interestingly, the expression of NKG2A and another inhibitory receptor, CD85j, was increased in patients with the most aggressive form of BC. Importantly, a slight increase in CD56bright NK cells expressing KIR was also observed in BC (74) and in non-small cell lung cancer (75) biopsies. These modifications were concomitant with a reduction in activating receptors (NKp30, NKG2D, DNAM-1, and CD16), as well as perforin-1 and granzyme B (74). The appearance of these CD56brightNKG2AhighKIRlow NK cells with impaired cytotoxic function in tumor biopsies further correlated with poor outcome in BC (74), as well as with tumor size in non-small cell lung cancer (75). In the context of metastatic melanoma, two recent publications with complementary results reported the presence of CD56bright NK cells with activated phenotype in tumor-infiltrating LNs (27, 76). Interestingly, the CD56dim subset was dominant in metastatic LNs (M-LNs) of all patients tested (CD56dim: 55.52 ± 21.5% versus CD56bright: 44.5 ± 21.5%), whereas the CD56bright subset prevailed in tumor-free LNs, as observed in healthy individuals (27). It was noted that M-LNs contained NK cells with increased activation profiles: CD56dim and CD56bright subsets displayed elevated surface expression of CD16, CD57, CD69, CCR7, NKG2D, DNAM-1, NCR, and KIRs. The work of Messaoudene et al. (76) further focused on the CD56bright NK cell population found in M-LNs of high-grade melanoma patients, and they described the differences in the phenotypes of CD56brightCD16− and CD56brightCD16+ subpopulations. Interestingly, CD56brightCD16+ NK cells exhibited increased activation profiles, with higher expression of NKp46, NKG2D, and KIR compared with their CD16− counterparts. These phenotypic distinctions between CD56bright subsets were not observed in mediastinal LNs obtained from brain-dead donors or in their peripheral NK cells. However, a subtype of CD56bright NK cells was reported to present a discrete expression of CD16. These cells were characterized as CD56brightCD94high and were considered an intermediate between CD56bright and CD56dim cells with regard to their maturation status (77). In BC, it was demonstrated that CD56bright NK cells expressing CD16 are increased in parallel with the grade of malignancy; however, these cells were significantly more competent in their killing and degranulation activity, as well as cytokine production, compared with CD16− cells following activation (25, 78). In light of the promising new results obtained with immune checkpoint inhibitors to treat melanoma patients (79), such as the mAb blocking CTLA-4 (ipilimumab), and those interfering with PD-1 and PD-L1, it would be interesting to further investigate their action on CD56bright NK cell phenotypes and functions. Especially because it was reported that, after the first ipilimumab treatment, the circulating CD56bright cells upregulated their expression of CD16 and PD-1, future investigations may help to delineate new prognostic and predictive markers for response to immunotherapies in cancer (80). In the context of autoimmunity, in the SF of RA patients, the vast majority of NK cells have a CD56bright phenotype (37); based on their high expression of CD69 and NKp44, they are activated cells (81). In addition, these cells are CD85j−, DNAM-1+, NKG2D+ (82) and, in particular, they show a higher expression of CD94/NKG2A and a more reduced expression of KIR, perforin, and CD16 in comparison with CD56bright NK cells in peripheral blood of the same patient (36, 37). To identify the cytotoxic mechanism of NK cells toward the pathogenic fibroblast-like synoviocytes (FLSs) in SF of RA patients, an in vitro approach with Nishi cells (82, 83), an NK cell line characterized by a receptor repertoire similar to the one of SF-resident NK cells, was used. The NK cell cytotoxic capability against FLSs appears to be mediated via the activating receptors DNAM-1, NKG2D, NKp44, and NKp46. Concomitantly, the expression of some ligands for the NKG2D (84) and DNAM-1 receptors (85) was detected in FLSs. In SF, IFN-γ production by CD56bright NK cells is regulated, in part, via CD94/NKG2A (81) and, in a contact-dependent fashion, this response is synergized after the interaction with monocytes under the influence of cytokines, such as IL-12, IL-15, and IL-18 (38). Furthermore, the NK cell–monocyte contact induces the differentiation of monocytes into osteoclasts (86). This is important because in RA, bone destruction results from a process of osteoclast differentiation that is associated with a pathway involving the receptor activator of NF-κB and its ligand (RANKL-RANK) (87, 88). Because RANKL is primarily expressed on the CD56bright subset (86), these cells have a high potential to induce osteoclast formation in the SF and to lead indirectly to the consequent bone destruction. In systemic lupus erythematosus, an increased expression of NKp46 on CD56bright NK cells is observed (42, 43). Recently, one study showed that MS patients have increased amounts of CD56brightCD16dim NK cells expressing KIR2DL5 compared with controls (89). In another context, chronic fatigue syndrome/myalgic encephalomyelitis (CFS/ME) is characterized by an immune dysregulation in peripheral blood. Immune dysregulation results in reduced NK cytotoxic activity and variation in KIR expression in CD56bright NK cells in moderate and severe CFS/ME after 6 mo of the disease compared with controls (90, 91). Thus, CD56brightCD16− NK cells expressing KIR3DL1/L2, as well as CD56brightCD16dim NK cells expressing KIR2DS4 and KIR2DL2/L3, were increased in patients with moderate CFS/ME, whereas CD56brightCD16dim NK cells expressing the KIR2DL1 receptor are increased in patients with severe CFS/ME. In primary HIV–infected patients, an increased expression of NKp46 (up to 100% of CD56bright cells) is observed, whereas the opposite occurs in chronically infected subjects, in whom NKp46 expression on CD56bright cells is even lower than in healthy donors (54, 92). In primary infection, NKp46 expression could be indicative of an early stage postinfection. Of special interest is the case of an asymptomatic hemophiliac patient coinfected with HIV and HCV (93). Despite very low T cell counts over decades, the patient never showed opportunistic infections or other effects associated with HIV or HCV infection, such as cancer or liver damage. Up to 40% of his lymphocytic count corresponded to NK cells, and among them 30–50% were CD56bright cells with a high expression of NKp30, NKp46, and NKG2D and low levels of CD69 and NKp44. Remarkably, exposure to target cells led to an impressive cytotoxic potential with a concomitant lack of IFN-γ production. Of note, this patient was characterized as subtype B, CCR5+. CCR5 is considered an important coreceptor for HIV entry. Human CCR5 is important in NK cell proliferation and circulation under physiological conditions. Interestingly, CCR5-deficient mice show a phenotype compatible with reduced NK cell number in several tissue compartments (94). This case reveals the possible role of NK cells, and in particular the CD56bright compartment, in the nonprogression of viral infections. The CD56bright NK cell subset is often depicted as regulatory. By using this term, the investigators frequently mean that these cells can influence innate immunity through cytokine production but that the same property also contributes to the shaping of the adaptive immune response. However, CD56bright NK cells also become cytotoxic after activation; under these conditions they can be regulatory in the sense of suppressive, by analogy with regulatory T cells. Thus, cytokine-activated CD56bright NK cells are cytotoxic toward autologous activated CD4+ T lymphocytes, a lysis that is partially inhibited via HLA-E expression on the target cells (95). This phenomenon might be therapeutically exploitable in the context of T cell–mediated autoimmune diseases (95), and the cytotoxic activity might even qualify this subset for use in cancer immunotherapy. Furthermore, Morandi et al. (96) showed that these NK cells overexpress several ectoenzymes, leading to the production of the immunosuppressive molecule adenosine, which inhibits the proliferation of autologous CD4+ T cells in a way similar to regulatory T cells. The effect of CD56bright NK cells in bacterial infections was demonstrated in vitro; in synergy with IL-2, exposure of NK cells to bacterial proteins through TLRs induces CD56bright NK cells to produce IFN-γ (97). Similar to the effect of single pathogen-associated molecular patterns, if NK cells are exposed to a whole pathogenic microorganism (e.g., Mycobacterium bovis bacillus Calmette-Guerin), high production of IFN-γ and a high proliferative potential are induced in CD56bright cells (98). In pleural fluid of patients with tuberculosis, NK cell numbers are reduced; however, the CD56bright population predominates and is characterized by a high production of IFN-γ after interaction with M. bovis. This CD56bright enrichment responds to an increased apoptotic susceptibility of the CD56dim counterpart (99). In a different scenario, but with a similar effect, patients with systemic inflammatory response syndrome or sepsis exhibit a low frequency of NK cells in peripheral blood and early NK cell activation during the development of sepsis (100, 101). Ex vivo stimulation with accessory cytokines and TLR agonists results in a significantly impaired production of IFN-γ from CD56bright and CD56dim NK cell subsets in comparison with NK cells of healthy individuals. However, the role of these two subsets in sepsis remains a big question. A review by Souza-Fonseca-Guimaraes et al. (100) exposed the favorable and detrimental effects of activated NK cells on bacterial-infected cells; however, studies on the particular effect of CD56bright cells on bacterial infections are scarce. Nevertheless, a recent investigation by Reinhardt et al. (102) showed that, after invasive visceral surgery, IFN-γ production by CD56bright NK cells in response to Staphylococcus aureus is severely impaired compared with the preoperative phase; this might explain, at least in part, the susceptibility of such patients to infections. Recent investigations focused on the action of CD56bright NK cells after daclizumab therapy. Expansion of this population is the most important biological effect of this treatment (103); it appears to reflect individual differences and might provide a basis for predicting the clinical response to daclizumab, a humanized mAb specific for the α subunit (CD25) of the human high-affinity IL-2R. In this context, the increase in circulating CD56bright NK cells is associated with preferential IL-2 signaling through IL-2R, decreased brain inflammation, and reduced survival of activated T cells (104). Indeed, the expanded CD56bright NK cells after treatment with CD25-blocking Ab kill autologous activated T cells in vitro (105, 106). The mechanisms behind this include the degranulation of granzymes A and K, followed by activation of a caspase-independent apoptosis that induces a mitochondrial dysfunction in activated T cells (107). Furthermore, IL-2/IL-2Ab therapy (mimicking daclizumab treatment) enhances the production of IFN-γ and MIP-1α by CD56bright NK cells, increases CD56dim NK cell cytotoxic capacity against K562, and is associated with an increase in perforin and granzyme B secretion (71). Daclizumab as an add-on therapy to IFN-β treatment results in a reversible expansion of CD56bright NK cells (108) with a several-fold increase in absolute CD56bright NK cell numbers, whereas the absolute numbers of T, B, or total NK cells do not change significantly (109). In this brief overview on CD56bright NK cells, we attempted to place them into the context in which they likely act in health and disease. It is not always clear whether their interventions are beneficial or detrimental to the host; probably both effects are possible, depending on the circumstances and the tissue microenvironment involved. The lineage relationship between CD56bright and other NK cell subsets and their precise hematopoietic origin are not resolved and deserve further study. Recent investigations underscore the importance of tissue-resident NK cells that might be different from the conventional CD56bright NK cells found in peripheral blood and in secondary lymphoid organs where they are likely to mature. These NK cells might be useful in immunotherapy if handled properly, but they have many more secrets to reveal. This work was supported by the Ministry of Research of Luxembourg and by the National Research Fund of Luxembourg (Ph.D. grant to B.B.).
. 2009. CD56bright natural killer (NK) cells: an important NK cell subset. Immunology 126: 458–465.
. 2014. Human natural killer cell development in secondary lymphoid tissues. Semin. Immunol. 26: 132–137.
. 2013. Signatures of human NK cell development and terminal differentiation. Front. Immunol. 4: 499.
. 2013. Mutations in GATA2 cause human NK cell deficiency with specific loss of the CD56(bright) subset. Blood 121: 2669–2677.
. 2015. Altered chemotactic response to CXCL12 in patients carrying GATA2 mutations. J. Leukoc. Biol. DOI:10.1189/jlb.5MA0815-388R.
. 2012. Partial MCM4 deficiency in patients with growth retardation, adrenal insufficiency, and natural killer cell deficiency. J. Clin. Invest. 122: 821–832.
. 2014. Clonal tracking of rhesus macaque hematopoiesis highlights a distinct lineage origin for natural killer cells. Cell Stem Cell 14: 486–499.
. 2014. No monkeying around: clonal tracking of stem cells and progenitors in the macaque. Cell Stem Cell 14: 419–420.
. 2015. The biology of innate lymphoid cells. Nature 517: 293–301.
. 2015. Innate lymphoid cells. Innate lymphoid cells: a new paradigm in immunology. Science 348: aaa6566.
. 2011. Natural killer-cell differentiation by myeloid progenitors. Blood 117: 3548–3558.
. 2015. Delineation of Natural Killer Cell Differentiation from Myeloid Progenitors in Human. Sci. Rep. 5: 15118.
. 2009. 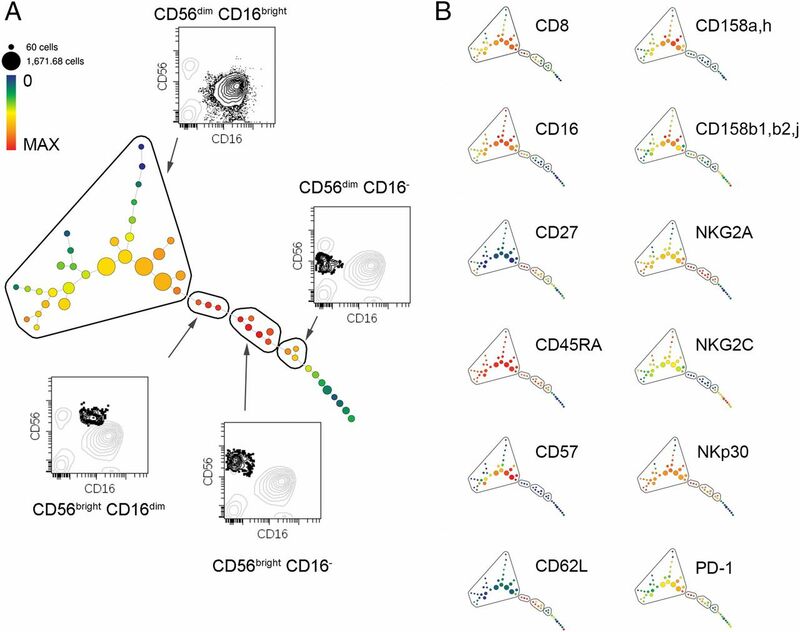 Functionally distinct subsets of human NK cells and monocyte/DC-like cells identified by coexpression of CD56, CD7, and CD4. Blood 114: 4823–4831.
. 2013. Epigenetic regulation of NK cell differentiation and effector functions. Front. Immunol. 4: 55.
. 2015. Practical NK cell phenotyping and variability in healthy adults. Immunol. Res. 62: 341–356.
. 2015. Natural killer cell immunosenescence in acute myeloid leukaemia patients: new targets for immunotherapeutic strategies? Cancer Immunol. Immunother. DOI: 10.1007/s00262-015-1720-6.
. 2003. Preferential apoptosis of CD56dim natural killer cell subset in patients with cancer. Eur. J. Immunol. 33: 119–124.
. 2009. Decreased levels of circulating regulatory NK cells in patients with head and neck cancer throughout all tumor stages. Anticancer Res. 29: 3053–3057.
. 2015. Increased sMICA and TGFβ1 levels in HNSCC patients impair NKG2D-dependent functionality of activated NK cells. Oncoimmunology 4: e1055993.
. 2013. Peripheral blood NK cells from breast cancer patients are tumor-induced composite subsets. J. Immunol. 190: 2424–2436.
. 2015. Multifunctional human CD56 low CD16 low natural killer cells are the prominent subset in bone marrow of both healthy pediatric donors and leukemic patients. Haematologica 100: 489–498.
. 2014. Enrichment of CD56(dim)KIR + CD57 + highly cytotoxic NK cells in tumour-infiltrated lymph nodes of melanoma patients. Nat. Commun. 5: 5639.
. 2011. Expansion of CD16-negative natural killer cells in the peripheral blood of patients with metastatic melanoma. Clin. Dev. Immunol. 2011: 316314.
. 2007. Peritoneal natural killer cells from epithelial ovarian cancer patients show an altered phenotype and bind to the tumour marker MUC16 (CA125). Immunology 122: 418–429.
. 2009. Primary human tumor cells expressing CD155 impair tumor targeting by down-regulating DNAM-1 on NK cells. J. Immunol. 183: 4921–4930.
. 2015. B7-H6-mediated downregulation of NKp30 in NK cells contributes to ovarian carcinoma immune escape. OncoImmunology 4: e1001224.
. 2010. NK cell dysfunction with down-regulated CD16 and up-regulated CD56 molecules in patients with esophageal squamous cell carcinoma. Dis. Esophagus 23: 675–681.
. 2011. The pathogenesis of rheumatoid arthritis. N. Engl. J. Med. 365: 2205–2219.
. 2011. The role of Natural Killer cells in the pathogenesis of rheumatoid arthritis: major contributors or essential homeostatic modulators? Immunol. Lett. 136: 115–121.
. 2011. Emerging role for NK cells in the pathogenesis of inflammatory arthropathies. Autoimmun. Rev. 10: 577–581.
. 2003. Natural killer cells in the synovial fluid of rheumatoid arthritis patients exhibit a CD56bright,CD94bright,CD158negative phenotype. Rheumatology (Oxford) 42: 870–878.
. 2002. A subset of natural killer cells is greatly expanded within inflamed joints. Arthritis Rheum. 46: 1763–1772.
. 2004. CD56bright NK cells are enriched at inflammatory sites and can engage with monocytes in a reciprocal program of activation. J. Immunol. 173: 6418–6426.
. 2015. High levels of natural killer cells are associated with response to tocilizumab in patients with severe rheumatoid arthritis. Rheumatology (Oxford) 54: 601–608.
. 2015. Homing receptor expression is deviated on CD56+ blood lymphocytes during pregnancy in Type 1 diabetic women. PLoS One 10: e0119526.
. 2011. Circulating CD56+ cells of diabetic women show deviated homing potential for specific tissues during and following pregnancy. Hum. Reprod. 26: 1675–1684.
. 2009. Increased proportion of CD56bright natural killer cells in active and inactive systemic lupus erythematosus. Immunology 126: 140–146.
. 2011. Phenotype and function of natural killer cells in systemic lupus erythematosus: excess interferon-γ production in patients with active disease. Arthritis Rheum. 63: 1698–1706.
. 2013. NCR3/NKp30 contributes to pathogenesis in primary Sjogren’s syndrome. Sci. Transl. Med. 5: 195ra96.
. 2013. Longitudinal peripheral blood lymphocyte subsets correlate with decreased disease activity in juvenile dermatomyositis. J. Rheumatol. 40: 1200–1211.
. 2015. T and NK Cell Phenotypic Abnormalities in Systemic Sclerosis: a Cohort Study and a Comprehensive Literature Review. Clin. Rev. Allergy Immunol. 49: 347–369.
. 2011. Intrathecal effects of daclizumab treatment of multiple sclerosis. Neurology 77: 1877–1886.
. 2011. Natural killer cell phenotype and clinical response to interferon-beta therapy in multiple sclerosis. Clin. Immunol. 141: 348–356.
. 2011. Novel mechanisms of immune modulation of natalizumab in multiple sclerosis patients. J. Neuroimmunol. 235: 70–76.
. 2011. Reduction of the peripheral blood CD56(bright) NK lymphocyte subset in FTY720-treated multiple sclerosis patients. J. Immunol. 187: 570–579.
. 2015. Tissue Distribution Dynamics of Human NK Cells Inferred from Peripheral Blood Depletion Kinetics after Sphingosine-1-Phosphate Receptor Blockade. Scand. J. Immunol. 82: 460–466.
. 2008. Immunoregulatory factors in multiple sclerosis patients during and after pregnancy: relevance of natural killer cells. Clin. Exp. Immunol. 151: 235–243.
. 2010. Early changes in frequency of peripheral blood lymphocyte subpopulations in severe traumatic brain-injured patients. Scand. J. Immunol. 72: 57–65.
. 2010. Perturbation of the natural killer cell compartment during primary human immunodeficiency virus 1 infection primarily involving the CD56 bright subset. Immunology 129: 220–233.
. 2015. Diversification and Functional Specialization of Human NK Cell Subsets. Curr. Top. Microbiol. Immunol. 395: 63–93.
. 2016. Human liver-resident CD56(bright)/CD16(neg) NK cells are retained within hepatic sinusoids via the engagement of CCR5 and CXCR6 pathways. J. Autoimmun. 66: 40–50.
. 2011. CD34+ hematopoietic precursors are present in human decidua and differentiate into natural killer cells upon interaction with stromal cells. Proc. Natl. Acad. Sci. USA 108: 2402–2407.
. 2014. Primitive neuroectodermal tumor in an ovarian cystic teratoma: natural killer and neuroblastoma cell analysis. Case Rep. Oncol. 7: 70–78.
. 2015. Comparative study of various subpopulations of cytotoxic cells in blood and ascites from patients with ovarian carcinoma. Contemp. Oncol. (Pozn.) 19: 290–299.
. 2015. Characterization of tumor infiltrating natural killer cell subset. Oncotarget 6: 13835–13843.
. 2013. NK cells from malignant pleural effusions are not anergic but produce cytokines and display strong antitumor activity on short-term IL-2 activation. Eur. J. Immunol. 43: 550–561.
. 2009. Differential upregulation of chemokine receptors on CD56 NK cells and their transmigration to the site of infection in tuberculous pleurisy. FEMS Immunol. Med. Microbiol. 55: 352–360.
. 2012. Peripheral natural killer cells exhibit qualitative and quantitative changes in patients with psoriasis and atopic dermatitis. Br. J. Dermatol. 166: 789–796.
. 2006. CD56brightCD16(−) NK cells accumulate in psoriatic skin in response to CXCL10 and CCL5 and exacerbate skin inflammation. Eur. J. Immunol. 36: 118–128.
. 2014. Comprehensive immunophenotyping of cerebrospinal fluid cells in patients with neuroimmunological diseases. J. Immunol. 192: 2551–2563.
. 2015. Natural killer cell subsets in cerebrospinal fluid of patients with multiple sclerosis. Clin. Exp. Immunol. 180: 243–249.
. 2013. NK cells in central nervous system disorders. J. Immunol. 190: 5355–5362.
. 2013. Consensus definitions and application guidelines for control groups in cerebrospinal fluid biomarker studies in multiple sclerosis. Mult. Scler. 19: 1802–1809.
. 2015. Daclizumab reverses intrathecal immune cell abnormalities in multiple sclerosis. Ann. Clin. Transl. Neurol. 2: 445–455.
. 2011. Interleukin-2/interleukin-2 antibody therapy induces target organ natural killer cells that inhibit central nervous system inflammation. Ann. Neurol. 69: 721–734.
. 2011. CD56brightCD16+ NK cells: a functional intermediate stage of NK cell differentiation. J. Immunol. 186: 6753–6761.
. 2011. Alternatively spliced NKp30 isoforms affect the prognosis of gastrointestinal stromal tumors. Nat. Med. 17: 700–707.
. 2011. Human breast cancer cells enhance self tolerance by promoting evasion from NK cell antitumor immunity. J. Clin. Invest. 121: 3609–3622.
. 2008. Natural killer cells infiltrating human nonsmall-cell lung cancer are enriched in CD56 bright CD16(-) cells and display an impaired capability to kill tumor cells. Cancer 112: 863–875.
. 2014. Mature cytotoxic CD56(bright)/CD16(+) natural killer cells can infiltrate lymph nodes adjacent to metastatic melanoma. Cancer Res. 74: 81–92.
. 2007. Induction of CD16+ CD56bright NK cells with antitumour cytotoxicity not only from CD16− CD56bright NK Cells but also from CD16− CD56dim NK cells. Scand. J. Immunol. 65: 126–138.
. 2015. Therapeutic Advances and Treatment Options in Metastatic Melanoma. JAMA Oncol. 1: 380–386. Tallerico, R., C. M. Cristiani, M. Capone, G. Madonna, D. Mallardo, E. Simeone, A. Dominijanni, A. M. Grimaldi, F. Colucci, P. A. Ascierto, and E. Carbone. 2015. Analysis of T and NK cells immune response in Ipilimumab treated Melanoma patients. J. Transl. Med. 13 (Suppl.1 ): O8.
. 2007. Activating and inhibitory receptors on synovial fluid natural killer cells of arthritis patients: role of CD94/NKG2A in control of cytokine secretion. Immunology 122: 291–301.
. 2014. Balance between activating NKG2D, DNAM-1, NKp44 and NKp46 and inhibitory CD94/NKG2A receptors determine natural killer degranulation towards rheumatoid arthritis synovial fibroblasts. Immunology 142: 581–593.
. 2013. NKG2D ligands as therapeutic targets. Cancer Immun. 13: 8.
. 2012. NKG2D and DNAM-1 activating receptors and their ligands in NK-T cell interactions: role in the NK cell-mediated negative regulation of T cell responses. Front. Immunol. 3: 408.
. 2010. Natural killer cells trigger osteoclastogenesis and bone destruction in arthritis. Proc. Natl. Acad. Sci. USA 107: 13028–13033.
. 2000. Involvement of receptor activator of nuclear factor kappaB ligand/osteoclast differentiation factor in osteoclastogenesis from synoviocytes in rheumatoid arthritis. Arthritis Rheum. 43: 259–269. 2013. Regulation of bone destruction in rheumatoid arthritis through RANKL-RANK pathways. World J. Orthop. 4: 1–6.
. 2016. Pilot Study of Natural Killer Cells in Chronic Fatigue Syndrome/Myalgic Encephalomyelitis and Multiple Sclerosis. Scand. J. Immunol. 83: 44–51.
. 2015. Longitudinal analysis of immune abnormalities in varying severities of Chronic Fatigue Syndrome/Myalgic Encephalomyelitis patients. J. Transl. Med. 13: 299.
. 2011. Immunological abnormalities as potential biomarkers in Chronic Fatigue Syndrome/Myalgic Encephalomyelitis. J. Transl. Med. 9: 81.
. 2015. Persistence of pathological distribution of NK cells in HIV-infected patients with prolonged use of HAART and a sustained immune response. PLoS One 10: e0121019.
. 2013. High number of CD56(bright) NK-cells and persistently low CD4+ T-cells in a hemophiliac HIV/HCV co-infected patient without opportunistic infections. Virol. J. 10: 33.
. 2011. Ccr5 deficiency regulates the proliferation and trafficking of natural killer cells under physiological conditions. Cytokine 54: 249–257.
. 2012. Cytotoxicity of CD56(bright) NK cells towards autologous activated CD4+ T cells is mediated through NKG2D, LFA-1 and TRAIL and dampened via CD94/NKG2A. PLoS One 7: e31959.
. 2015. CD56brightCD16- NK Cells Produce Adenosine through a CD38-Mediated Pathway and Act as Regulatory Cells Inhibiting Autologous CD4+ T Cell Proliferation. J. Immunol. 195: 965–972.
. 2004. Direct bacterial protein PAMP recognition by human NK cells involves TLRs and triggers alpha-defensin production. Blood 104: 1778–1783.
. 2005. Human CD56bright and CD56dim natural killer cell subsets respond differentially to direct stimulation with Mycobacterium bovis bacillus Calmette-Guérin. Scand. J. Immunol. 62: 498–506.
. 2005. Increased susceptibility to apoptosis of CD56dimCD16+ NK cells induces the enrichment of IFN-gamma-producing CD56bright cells in tuberculous pleurisy. J. Immunol. 175: 6852–6860.
. 2012. Toll-like receptors expression and interferon-γ production by NK cells in human sepsis. Crit. Care 16: R206.
. 2015. Invasive Surgery Impairs the Regulatory Function of Human CD56 bright Natural Killer Cells in Response to Staphylococcus aureus. Suppression of Interferon-γ Synthesis. PLoS One 10: e0130155. 2012. Anti-CD25 (daclizumab) monoclonal antibody therapy in relapsing-remitting multiple sclerosis. Clin. Immunol. 142: 9–14.
. 2013. Natural killer cells and their receptors in multiple sclerosis. Brain 136: 2657–2676.
. 2015. CD56(bright) natural killer cells and response to daclizumab HYP in relapsing-remitting MS. Neurol. Neuroimmunol. Neuroinflamm. 2: e65.
. 2010. An IL-2 paradox: blocking CD25 on T cells induces IL-2-driven activation of CD56(bright) NK cells. J. Immunol. 185: 1311–1320.
. 2011. Unexpected role for granzyme K in CD56bright NK cell-mediated immunoregulation of multiple sclerosis. J. Immunol. 187: 781–790.
. 2011. Intermediate-affinity interleukin-2 receptor expression predicts CD56(bright) natural killer cell expansion after daclizumab treatment in the CHOICE study of patients with multiple sclerosis. Mult. Scler. 17: 1441–1448.
. 2010. Daclizumab in active relapsing multiple sclerosis (CHOICE study): a phase 2, randomised, double-blind, placebo-controlled, add-on trial with interferon beta. Lancet Neurol. 9: 381–390.